After the latest breakdown of a HP LaserJet m1522nf multi-function printer and the unprofessional customer service provided, I won’t consider buying HP printers anymore. 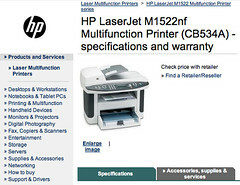 HP LaserJet used to mean quality and I think my old LaserJet 3330 came with a 2-3 year warranty (more on this later). Unfortunately, the now dead m1522nf only came with one year warranty and it died after only 18 months. The printer couldn’t finish its powering up initialization sequence and the tiny LCD display on the printer wouldn’t even come up. So the HP LaserJet is quite dead after its short life of 18 months. An unreliable and inferior quality product was bad already but what made the situation worst was HP’s broken/substandard “customer service”. When I first called HP customer service, I still harboured faint hope that HP would stand behind their products, do the right thing and fix the printer free-of-charge even it is just 6 months out of its 12 month warranty. Failing that, I just wanted the customer service rep to provide a case reference number for my record. And this is where HP customer service failed completely. The Costa Rica based rep and her supervisor refused to provide a case number unless an address, phone number, and email address were provided. As a disappointed customer, I have no interest in giving HP any future business and have no desire to provide them further with my private information. Is this too difficult for HP to appreciate? To me, the sad thing is that HP printers used to stand for quality, reliability, and good customer services. Remember my old LaserJet 3330? The customer service and warranty was so good in the past that they shipped a new replacement unit to me free-of-charge when I had problem! Unfortunately, this is definitely NOT the current HP customer service anymore! Substandard, easily broken printers and horrible customer services have put me off from buy any HP printers in the future. I don’t know if my bad HP experiences are unique, if many people are experiencing the same problem, it is sad to see a formerly good brand’s image being tarnished by poor quality products and bad customer services. P.S. By the way, I want to be clear that I have no problem with outsourcing customer service departments to international locations with cheaper cost AS LONG AS these international locations can provide equal or better customer services. When these outsourced customer service departments failed, they can easily destroy good reputations built over decades! This entry was posted in Customer Service and tagged Costa Rica, Customer Service, Hewlett-Packard, HP, Support. Bookmark the permalink.